Whether it is an altar to an unknown god or the New Atheists, Christians have always faced the challenge of translating the Gospel message within the surrounding culture. This is no less true for the tangled web that is 21st century America. Edited by global scholar Robert Kolb, these essays by Concordia Seminary, St. Louis, faculty engage numerous facets of American culture—from politics to science, the movies to new media—to find the interconnections between the “American mind” and the mind of Christ. In short, it’s a Christ-meets-culture primer for the postmodern world. The book includes nine essays and Dr. Kolb’s preface and is perfect for a summer read, a Bible class, or a small group discussion. Or all three. American Mind‘s been getting plenty of buzz around campus. Students have been talking about it since we launched it at the faculty writers reception. Alumni were talking about it at the Alumni Reunion. Scholars were talking about it at the ILC conference in Fort Wayne. And now you can get it. It is available on Amazon.com, at the Concordia Seminary bookstore, or by calling the Sem Press office at 314-505-7117. The list price is $14.99. 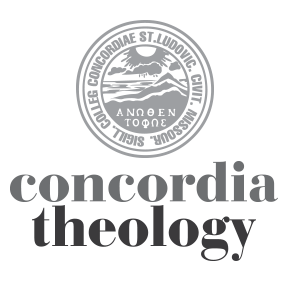 Stay tuned at concordiatheology.org too. We’ll be blogging about what’s inside the American Mind. The first copy of The American Mind meets the Mind of Christ has arrived in Japan! Last night, I presented a copy to the president, Masaki Makito, for the library at Kobe Lutheran Theological Seminary.